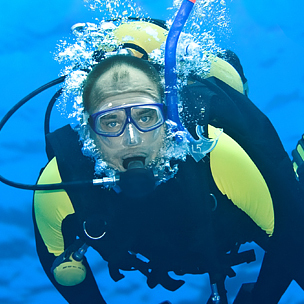 You have to be an Advanced Open Water Diver or 2* CMAS Diver (or equivalent level) or above. You are able to stay for a minimum of 2 months or longer. What we offer is knowledge combined with experience and fun. Throughout your stay, and depending on the duration, you can get you next diploma's) after the exams needed, up to Assistant Instructor. You have 1 day off per week. We also offer accommodation in a double room with shower and WC, in our private Staff House, 300m far from the Dive Centre. Your airline ticket to Zakynthos you pay for yourself. In the accommodation is also dinner included at Harbor House Tavern! And sometimes we all get together for a BBQ. The other meals are at your own expenses. Breakfast can be taken at the balcony of the rooms or at the Dive Centre. For lunch you can have a small snack at the Dive Centre, between the dives, after agreement with the rest of the staff.